This week, we're talking with Jimmy Bridgeman, the owner of Rock Solid Studios in Dunlap; and with musician David McDonald. Bridgeman says he started his studio in an affort to provide a quality recording facility for local musicians. They've since expanded to add songwriting workshops amd open-mic nights, and their "Coffeehouse sessions." 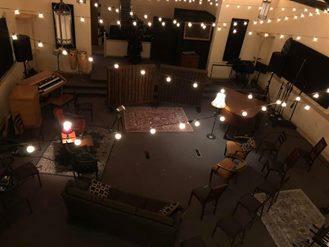 Those combine elements of a recording studio and a small performance venue. McDonald will be performing at this weekend's Coffeehouse session. He's in the process of trying to put together a recording of original music. He talks about the value that the studios, and the coffeehouse series, have for musicians; and about some of the economics of the music business. The next Coffeehouse session will be Saturday night at 7:00 at Rock Solid Studios, at 309 North 2nd Street in Dunlap. Musician David McDonald, and Jimmy Bridgeman of Rock Solid Studios, talk about tomorrow night's Coffeehouse Session with the band Pauper Hill. This week, we're talking with Marty Wombacher, about this weekend's performance of "The Marty Monologues." He's the writer behind the "Meanwhile Back in Peoria blog," and the show features his stories of growing up in Peoria in the 1960s. The performance incorporates local musicians Sarah Marie Dillard and Brandon Mooberry. After the Peoria performance, Wombacher will present the show in Chicago and New York. "The Marty Monologues" will be performed Sunday night at 7:00 at the Apollo Theater in downtown Peoria. This week, we're talking with Jonathan Wright, Editor-in-Chief of Peoria Magazines. The company is launching a new publication, "Peoria Magazine," that will combine their coverage of business, lifestyle, and the arts in central Illinois. The new magazine will combine the features that were previously available in the company's "Art and Society" and "Interbusiness Issues" publications. It also incorporates new features and contributors. Peoria Ballet Opens Its Production of "Alice in Wonderland" and "Paquita"
This week, Jenn Gordon talks with Wendy Thomasson and Jorge Laico of the Peoria Ballet. They discuss the upcoming production of Alice in Wonderland and Paquita. Lewis Carroll’s classic story is transformed into a charming ballet. This family friendly adventure will transport you to a colorful fantasy world full of exhilarating fun! Plus, one of the ballet world’s all time classics – Paquita.